The IMF’s mission in Ukraine has said the country’s GDP is expected to shrink 9 percent this year, with annual inflation jumping to 46 percent. Unresolved conflict in the country’s east took a big toll on the economy in the first quarter of 2015, it said. The projections released on Sunday mark a downgrade from April estimates, when the regulator predicted the country’s economy would shrink by 5 percent. The report wraps up the mission’s two-week visit to Kiev to hold discussions on an economic reform program. The estimated inflation rate in Ukraine is mostly due to the fluctuation in energy prices and a major depreciation of the exchange rate in February, the statement said. 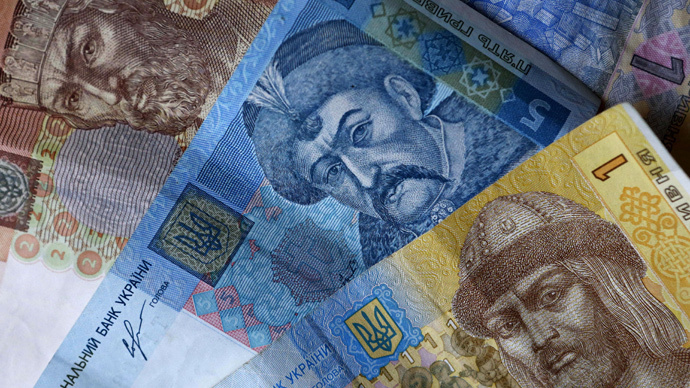 Ukraine’s national currency, the hryvnia, has lost more than half its value so far in 2015. However, the IMF mission said there are signs economic stability in Ukraine has been gradually taking hold in the recent months. “The foreign exchange market has remained broadly stable. Gross international reserves, although still very low, have increased to $9.6 billion at end-April,” the report said. Ukraine’s commitment to economic reform remains strong, the mission’s chief Nikolay Gueorguiev said at the end of the visit, adding that understanding was reached on most issues. Kiev has to reach an agreement with the IMF in order to receive its next $2.5-billion tranche of a $17.5-billion loan. The creditor will release money only if it’s satisfied with the economic, budget and monetary reforms in the country. Ukraine has to present a “program of deep economic reforms,” the country’s 2015 budget has already seen drastic pension cuts and energy bills tripling. Under the IMF bailout terms, prices for gas used in cooking and heating water skyrocketed from $43 to $263 per 1,000 cubic meters. Ukraine’s total debt is estimated at around $50 billion, of which $30 billion is external debt and $17 billion internal debt. Public sector debt rose to 71 percent of Ukraine’s gross domestic product, and is due to rise to 94 percent of GDP in 2015, the National Bank of Ukraine said in April. Last week, Ukraine’s President Petro Poroshenko signed into law a bill that allows the government to set a moratorium on the repayment of foreign debt. The moratorium was said to be needed due to the complicated financial situation in the country. The Group of Seven says it will support Ukraine. Russia was expelled from the club last year over supporting the referendum in Crimea and will be not present at the upcoming G7 summit in Bavaria in June.